Cafe Campagne: This one is a sit-down restaurant, but if you went mid-day we'll bet you could just order dessert. They keep it seasonal; choices might include a tarte tatin, hazelnut crème brûlée, or a dreamy pear clafoutis with walnut ice cream. 1600 Post Alley, (206) 728-2233; online at campagnerestaurant.com. Chukar Cherry Co.: OK, so we always thought these looked sort of gimmicky and never tried one until someone gave us a free sample...at which point we were converted. These things are good: chocolate covered cherries, nuts and berries, and all preservative-free to boot. They're available for online purchase too. Main Arcade, just north of Athenian/Lowells restaurants; online at chukar.com. Cinnamon Works: With a bent toward organic and vegan baked goods, the pastries here are large enough to share and they have a great open kitchen so you can watch them work. For us, the standout is their pumpkin cookies, which are really more like scones or small cakes, with a glaze frosting that might make your eyes glaze over with happiness. 1530 Pike Pl. ; (206) 583-0085. The Confectional: These people know what they're doing. Their cheesecakes (in various sizes as well as truffle versions) are rich, velvety and have an absolutely perfect cheesecake-to-crust ratio. But don't dare leave without trying the spicy Colombian hot chocolate, which is akin to liquid gold. 1530 Pike Pl., (206) 282-4422; online at theconfectional.com. (Check out our Batter Chatter interview with owner Paul Verano too!). Crepe de France: We like it when a pastry can go either sweet or savory, and crepes are just such a dish. Why not have their popular salmon, cream cheese, onion and dill with Bechamel sauce for lunch or dinner, and then try owner Nany Price's favorite for dessert: a sweet crepe filled with fresh strawberries, nutella and whipped cream. 93 Pike St., Ste 4; (206) 624-2196. The Crumpet Shop: We are always surprised but charmed by the constant state of disarray here: with just a few regular kitchen toasters to complete a mass volume of orders, it's always a jumble...but we love them anyway. Their crumpets are just the way they ought to be, craggy and toasty; scones are buttery, biscuity and delicious, but often sell out well before teatime. 1503 First Ave.; (206) 682-1598. Daily Dozen Donut Co: Cute punk rockers frying up sweet treats and shaking them with powdered sugar to order...we think that says it all! If it doesn't though, check out our Doughnut Guide to Seattle. 93 Pike St. Ste. 7; (206) 467-7769. DeLaurenti: Their bakery is largely comprised of goodies from good local places (Le Panier, Essential Baking Company, Macrina); however, the cookies (chocolate chip, oatmeal raisin and butter) and brownies, which are a rich delight, are made in-house every day. 1435 First Ave.; (206) 622-0141; online at delaurenti.com. La Buona Tavola: Mostly a truffle (not chocolate) cafe, but don't pass it by. It's worth a visit for their gorgeous chestnut spreads: either sweet chestnut cream, or chestnut with almond, honey and hazelnut. They'll brighten up your toast at breakfast for sure. They're available online too! 1524 Pike Pl. ; (206) 292-5555; online at trufflecafe.com. Le Panier: Translated, this means "bread basket"; the bakery was started by a Frenchman who missed his daily baguette and croissant. It's very Frenchy, combining elements of both boulangerie and patisserie: racks of freshly baked loaves flanked by alluring cases of charlotte citron, eclairs, charlotte framboise, macarons and palmiers. 1902 Pike Pl. ; (206) 441-3669; online at lepanier.com. Local Color: When you walk in here, you remember how cool Seattle was in the 90's. Vita Coffee and decent (but not excessively memorable) pastries...but excellent people-watching. Sneak in a cookie from Cinnamon Works and you're golden. 1600 Pike St., (206) 728-1717. Matt's in the Market: Another sit-down place. We once asked the waiter "what dessert's good here?" and when he said "Oh, the bread pudding," his voice became...softer. Dreamy. And this is a dreamy pudding: custardy and carbohydratey, and very much worth saving room for. 94 Pike St., Ste. 32; (206) 467-7909; online at mattsinthemarket.com. Mee Sum Pastry: Even though they have savory ingredients like pork and chicken, the hombows are sweet enough that they blur the line between dinner and dessert; but we go there for the almond cookies of varying sizes, from thumbrint-sized to big-as-your-head. 1526 Pike Pl. at Post Alley; (206) 682-6780. Mr. D's Greek Delicacies: Sometimes, you want the taste of honey. At those times, go straight to Mr. D's, where they have a classic baklava and greek pastries. They are kept close to the falafel and meats though, so we think they taste better earlier in the day. 1518 Pike Pl. ; (206) 622-4881; online at mrdsgreekdelicacies.net. Pappardelle's Pasta: Pasta for dessert? Okay. Don't miss this homemade pasta stand; one of their bestsellers is their dark chocolate linguine. Make it as you would regular pasta, but then top it with ice cream and strawberries for an unexpectedly sweet treat. Happily, it's available for purchase online too (also check out the web site for some recipe suggestions and where to find Pappardelle's Pasta at Farmer's Market locations throughout the US). 1501 Pike Pl., Ste. 8; (206) 340-4114; online at pappardellesonline.com. Pike Place Bakery: They have an amazing array of baked goods, from divinity to enormous donuts to exceedingly rich (and exceedingly delicious) iced brownies. Their cakes are big and homey looking, and remind several of our spies of the cakes from neighborhood Italian bakeries from the East Coast. 1501 Pike Pl. 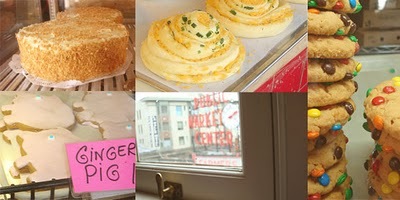 ; (206) 682-2829; pikeplacebakery.com. Piroshky Piroshky: The lines stretch long on the weekends in front of this Russian bakery, and why not: the view from their small streetside window is very engaging, with doughy yeast pastries waiting to go in the oven, as well as strangely appetizing and fascinating shellacked samples of what's available inside. But what will really get you is the smell as you walk by: the buttery, cheesy, yeasty air that emanates is very hard to resist. 1901 Pike Pl; (206) 441-6068; online at piroshkybakery.com. Starbucks: Call them the big bad corporation, but we've always found their drip coffee to be hot, strong and consistent, whereas (it has to be said) at some other coffee locations, your coffee might only be as good as the barista's mood. But don't go here for pastry: they don't have a bakery case, only a small selection of impulse-buy cookies by the register. So do go in for a coffee, but you've got bigger and better cakes to seek. 1912 Pike Pl. ; online at starbucks.com. Three Girls Bakery: On one visit, Head Spy Jessie asked for "just a chocolate drop", to which the response was "they're not just chocolate drops." How true. The cookies and pastries look like standard fare here, but when you bite into them, they're a step above. There's a reason why they're one of the oldest businesses in the market. 1514 Pike Pl. ; (206) 622-1045. Honorable Mention: Beecher's Cheese Because this is a pastry blog, we're putting them as honorable mention, but their cheeses are a treasure in their own right; and hey, you need protein to counter that sigar high, so why not get it here? Some days, you can even see the cheese being made in enormous vats, which are visible through large windows. It's hypnotic. 1600 Pike Pl. ; (206) 956-1964; online at beechershandmadecheese.com. For more information on the Pike Place Market, visit pikeplacemarket.org. In United Arab Emirates, emirates airlines is one of the leading airline company of international standard. The discount airline tickets are also provided by the different travel agency dealers who have direct contacts with the airline companies. The indian airlines offers the fantastic services for the national and international passengers. You may get information about spirit airline from the online sources.